On this day in history, the Great Railway Strike of 1877 was started in Baltimore and the first AK-47 came off an assembly line in 1947. That was “Duke of Earl” by Gene Chandler, who was born Eugene Dixon today in 1937 in Chicago. He is a songwriter, singer, music producer and executive who became known as “The Duke of Earl” and “The Duke”. Happy birthday. A number of abolitionists formed parties to take on the political establishment around slavery on this day. Today in 1854, the Republican Party was formed when abolitionists came together with disaffected members of the Whig Party (then a major political force), folks called the Modernists and Free Soilers on a platform of “free labor, free land, free men” – free labor was their opposition to slavery and free land was their opposition to slave owners buying up all the land to keep regular yeoman, as they were called, from farming. Four years later they took the White House with the election of Abraham Lincoln, the 16th President of the United States. And in the same era, the Great Railway Strike of 1877 began as a strike against the Baltimore & Ohio railroad. It engulfed the nation and was centered right here in Baltimore. The Great Railway Strike was the first time that federal troops were brought in to quell a labor dispute. And 15 years later in 1892 3,800 striking steelworkers went up against Pinkerton agents during the Homestead Strike. Ten people were killed and dozens were wounded as the Labor movement began its push for higher wages and better working conditions. Before breaking the color barrier in Major League Baseball, Jackie Robinson was a Lt. in US Army during World War II. In 1944, while riding on a military bus to the hospital sitting next to the wife of another officer who could have passed for White, he was confronted by the driver cursing at him, calling him racial epithets and demanding that he move to the back of the bus. Jackie Robinson refused, stood up to the driver, and was then court martialed and put on trial. Lt. Jackie Robinson won his case. Imagine if he had been convicted — he may never changed history through baseball. The brilliant Mexican ground-breaking surrealist artist and revolutionary whose image and images lived way beyond her years, Frida Kahlo, was born today in Coyoacán, Mexico. As was the one of the planet’s most important and resonating spiritual voices … the Dalai Lama, who turns 80 today. One of our sister organizations, The Nation Magazine published its first issue today in 1865, The Fight for Reconstruction. 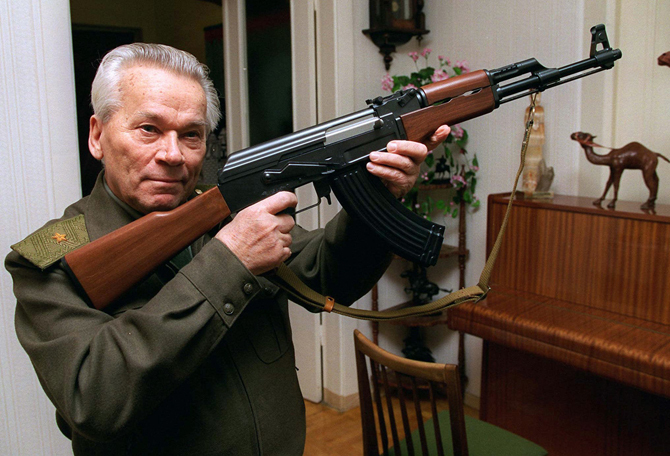 In 1947, the AK-47 came off the assembly line. It is known as the best combat rifle ever designed, and it symbolized the Soviet Union, communism and revolution. Speaking of, the Soviet Union came into existence today in 1923. And public radio staple, Garrison Keillor’s Prairie Home Companion began airing today in 1974. The Ibo people of what is now Nigeria declared themselves the independent nation of Biafra today in 1967, thus beginning the Nigerian Civil War began. Althea Gibson today in 1952 became the first Black woman to win the world championship of tennis at Wimbledon. And the first MLB All-Star Games were played in Chicago’s Chomsky Park. The American League defeated the National League 4-2. Here’s a song for your July the 6th. Today in 1911, Wobbly and anarchist labor organizer Joe Hill’s song “The Preacher and the Slave” first appeared in the IWW’s Little Red Song Book. And we hear Ani DiFranco and Utah Phillips’ version of that song … The Preacher and The Slave.